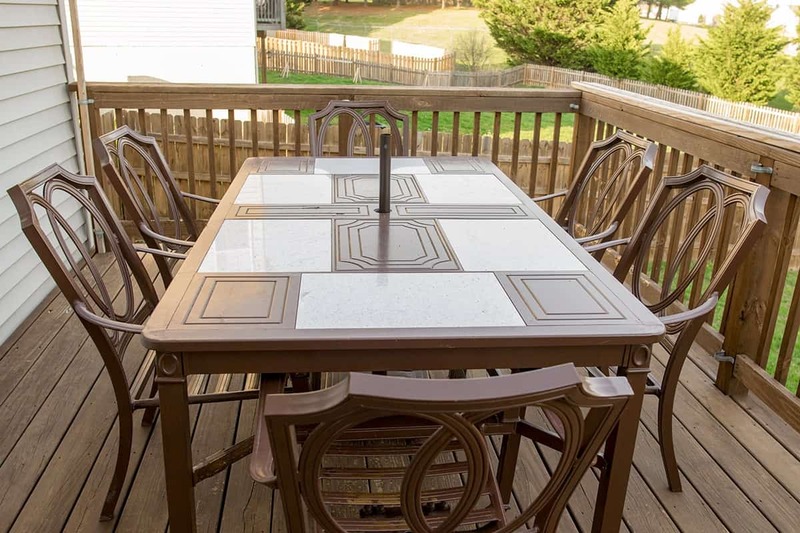 One of the best and cheapest ways to update a deck or patio is to refresh the outdoor furniture. 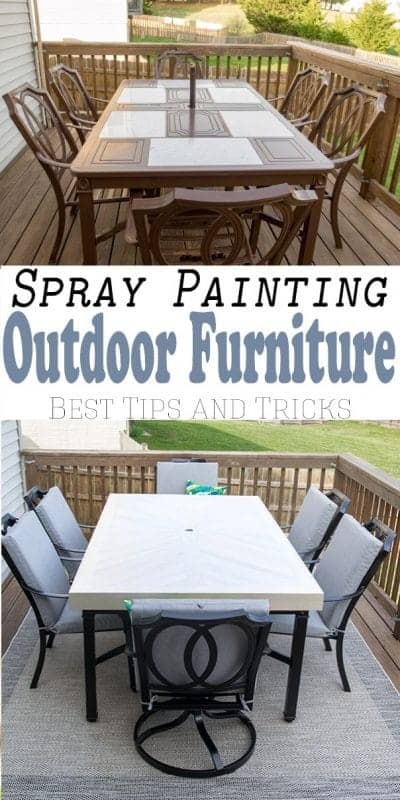 Today, I am sharing with you how to makeover outdoor furniture with spray paint! Depending on the size and condition of your furniture, it may take only an afternoon or a few days. The set below took us about 4 days to do our large dining set completely, but it will last beautifully. Thank you to Rust-Oleum for sponsoring our outdoor project. As always, opinions and tips are 100% mine. I only share products I love and would purchase myself. It’s finally feeling like spring around here and that always puts my mind towards checking off some outdoor projects. A few months ago, I purchased this set at the Habitat for Humanity ReStore for a steal at $65. We already changed out the wood top, which you can see HERE. In this picture, the paint doesn’t look too bad, but it’s actually chipped and flaking so it needed a good refresh. 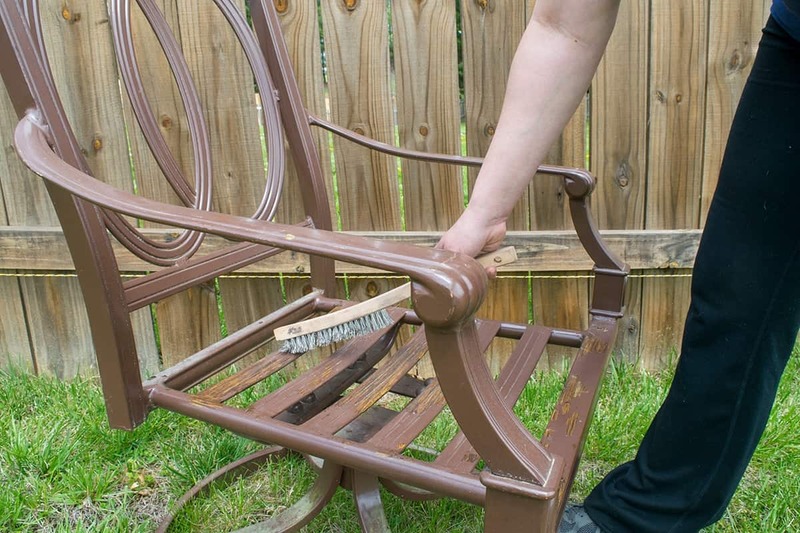 I recommend starting with a wire brush to knock off any rust build-up or chipping paint. The idea here is to scrape off any areas that are rusty or flaking. I still recommend a wire brush before sanding, because sandpaper doesn’t get as well in the crevices for flaking paint. After wire brushing, lightly sand any glossy old paint or debris with 220 grit sandpaper on a palm sander or sanding blocks. I really like the flexible sanding blocks for this type of project because it’s easier to get in the corners and crevices. Personal preference, but I find that using 1 level lower grit for sanding sponges is fine (i.e. 120 instead of 220), especially if the sponge has a coating on it. You only need to rough up the glossy top coat and not go all the way down to the bare metal or leave swirl marks. The sanding also helps smooth out any areas where the paint has chipped. Lastly, to prepare the outdoor piece, you will want to give it a good cleaning with TSP to remove any grease, dirt, or debris. This will ensure a good bond for the paint and primer. Next, you will want to setup for spray painting. Generally speaking, you will want to elevate the chairs or furniture so you can get around the bottom and undersides. If you have a table, that’s great, or you can use bricks, cement stones or anything you can set it on. Most of the time I use extra 4×4 pieces of wood. Lay a drop cloth over it and you are ready to paint! One last thing to note about the weather – don’t spray paint in full sun and preferably on a day that isn’t windy. Even on calm days, spray paint can drift several feet so make sure there isn’t anything around that you don’t want overspray on. I sprayed the morning after it rained so the pollen would be lower. There is no need to prime areas that still have their base coat intact, but any areas of bare metal will need to be primed. I personally prefer a separate primer, such as Rust-oleum Clean Metal Primer especially for metal, rather than a paint+primer product. I also highly recommend these Rust-Oleum Comfort Grips. They aren’t expensive, and you can use them again and again with most spray paints. I love them because my hands aren’t sore after painting large projects and they help keep the spray paint application more even. 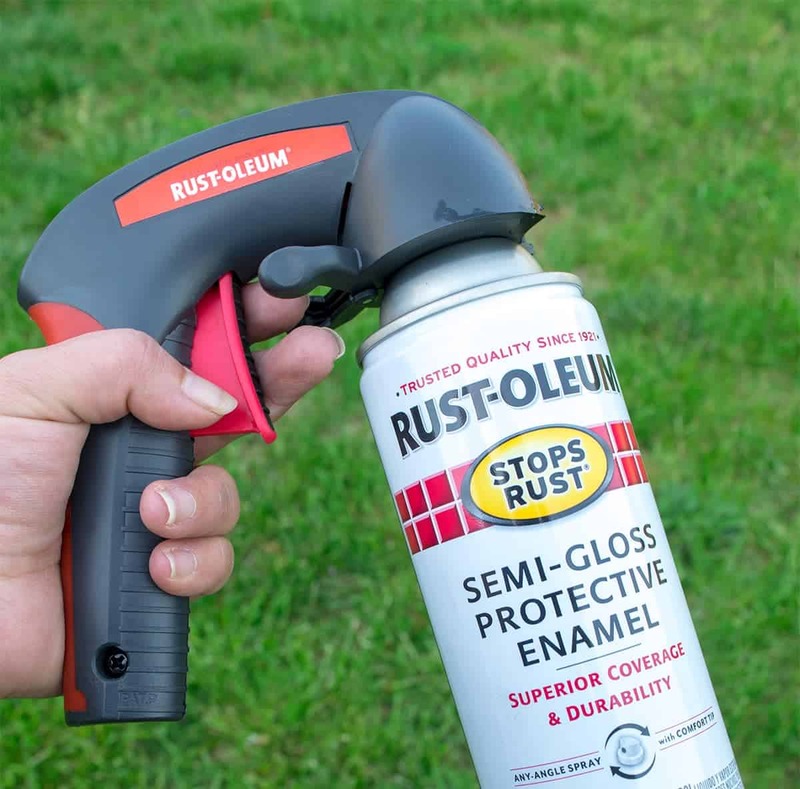 If you are looking for more project ideas and the best spray paint for your project, check out Rust-Oleum’s Website. For priming and painting, use light coats to avoid drips and sweep past the edges. I don’t worry about getting full coverage in one coat, because that might lead to drips. Do let dry according to directions between coats. Spray paint in multiple angles to fully cover the piece (even the bottom). 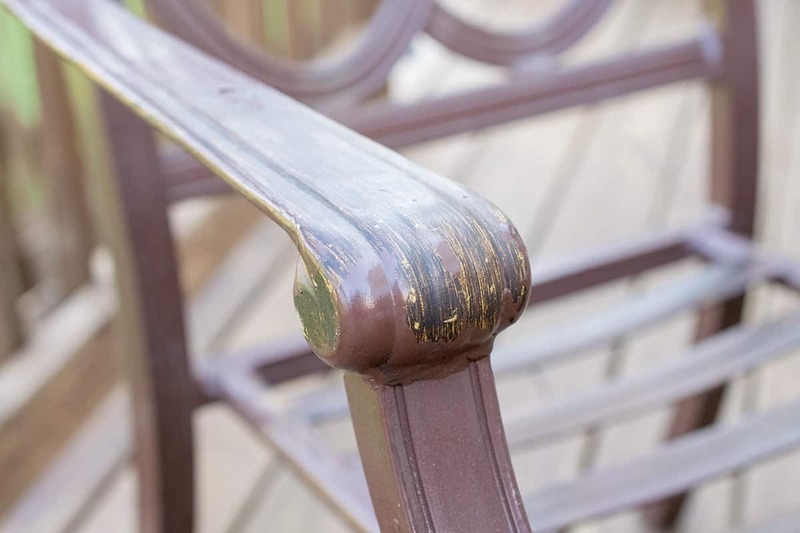 *Tip: I like products specifically for outdoor furniture and durability like Rust-Oleum Semi-Gloss Protective Enamel. It took about 1 can per chair to fully coat. Wait at least 48 hours before putting any cushions or decorations on. This is just the start of our outdoor projects this season, but what a good start it is! 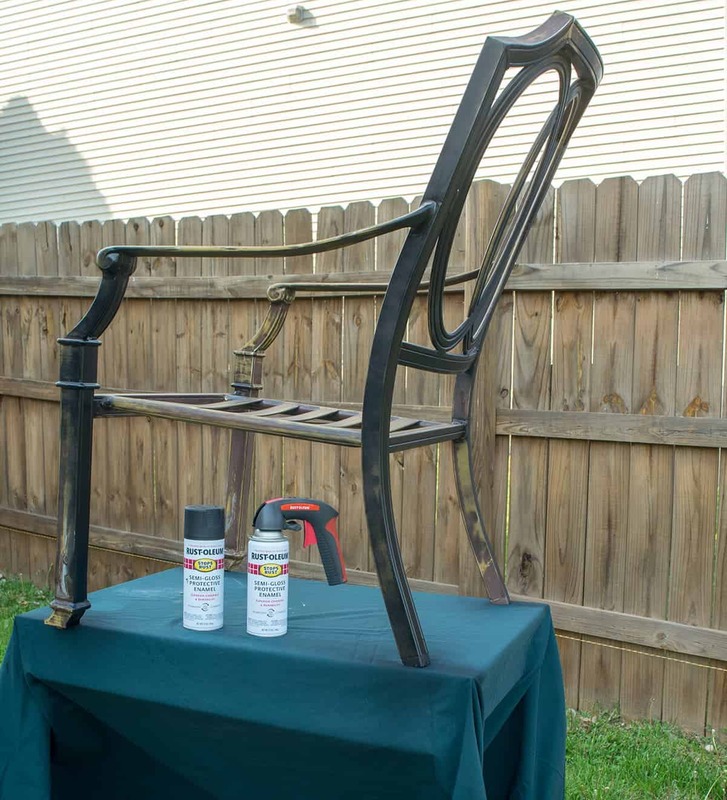 Now it’s your turn to get started with an easy spray painting project using Rust-Oleum Spray Paint (my personal fave). I feel like so many people get overwhelmed, but small projects and just checking those simple projects off like spray painting are so motivational. 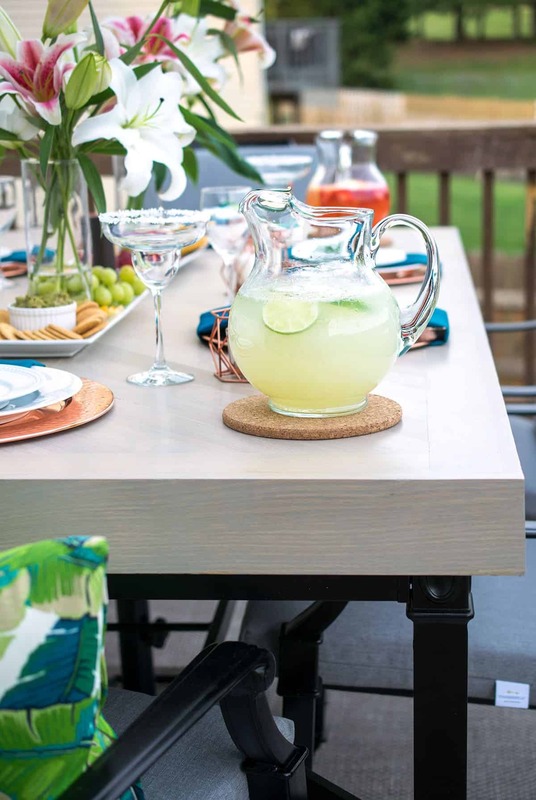 Or you can just kick back and enjoy some summertime margaritas with your new project! 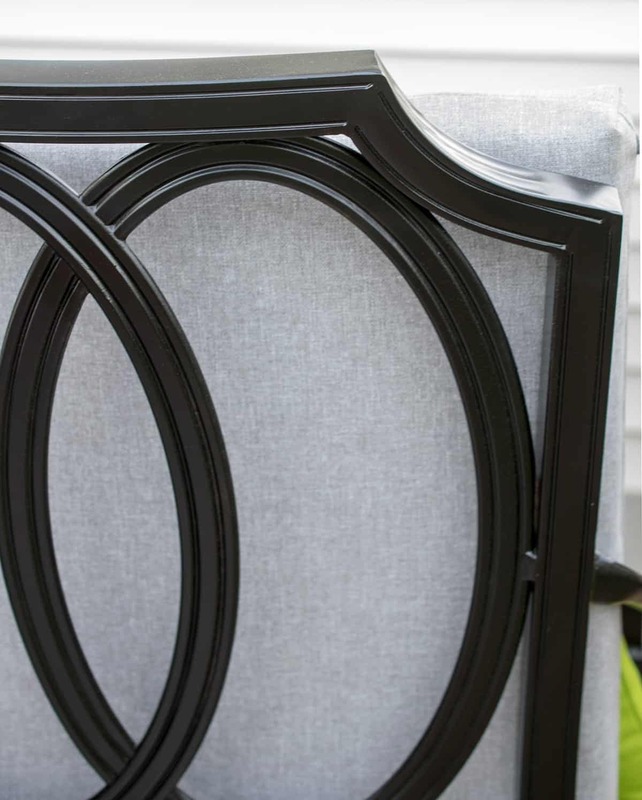 Wonderful article to read if you want to make your furniture look as new.This article will be a guide. 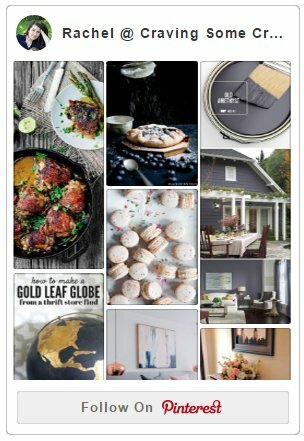 Thanks so sharing such amazing article .I would love to try on my furniture.